Our name, Tribal Spirit is synonymous with unique, superbly hand crafted native art that is both beautiful and functional. Our passion is to build the spiritual tools required by the First Nations community, especially powwow drums and hand drums. Our specialty is traditional native powwow drums which are being played by many of the best most original powwow drum groups throughout North America. We also make native hand drums, drum sticks, dreamcatchers, rattles, medicine shields, staffs, fans, leather bags, medicine pouches and black ash baskets. Each year during hunting season we gather hides from hunters who are eating the meat but throwing the hides away. We are now offering Deer and Moose Raw Hide, as well as Buffalo Hide when available. The Deer are larger (12 to 15 sq ft) than normal and we carefully select clean/no hole hides. 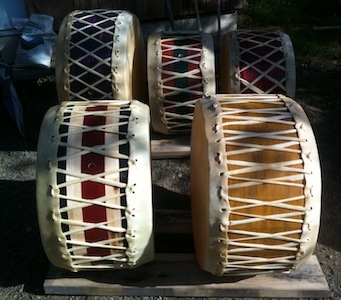 Please visit our e-commerce site where you will be able to click and buy Native Drums and Music Produced by us.